HOUSTON (AP) Justin Verlander is convinced: Baseballs are slicker. Rich Hill isn’t so sure. With home runs soaring to record levels during the regular season and the World Series, juiced balls are on pitchers’ minds. 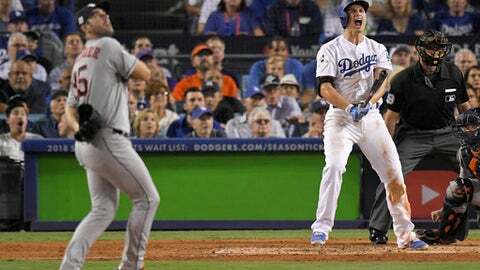 Fifteen home runs were hit as the Astros and Los Angeles Dodgers split the first four games. That includes a record eight in Game 2 – five of them in extra innings. The record for a six-game series is 17 in 1953, 1977 and 2009. The overall mark of 21 was set by Anaheim and San Francisco over seven games in 2002 – the season before survey drug testing. Speculation that something is amiss has been fueled by a study claiming to have found differences in the size and seam height of balls since the 2015 All-Star break. ”I know Mr. Manfred said the balls haven’t changed, but I think there’s enough information out there to say that’s not true,” he responded. Astros pitcher Dallas Keuchel was quoted as saying after Game 2: ”Obviously, the balls are juiced.” San Francisco’s Johnny Cueto and Toronto’s Marcus Stroman also think the balls have changed, with Stroman blaming slick balls for a rise in pitcher blisters – an affliction which has struck Hill a few times in the past couple seasons, too.